In an Empire there arise border disputes with the barbarians who live in the forests and deserts outside the gates. Troops are sent to the fort at the border. The 1st person narrative is told by theunnamed Magistrate at the fort. When the Empire troops bring in a band of barbarians for torture and questioning the Magistrate helps a blind girl they leave behind. He becomes attached to her but feels guilty so he and some men take her back to her tribe. When the Magistrate returns he is arrested for deserting his duty and breaking the rules about contact with the barbarians. He is held in a cell, starved, tortured, berated, and mostly left to die – but he doesn’t. Rather he takes up a one-man crusade for justice. The torture scenes were graphic and a bit long for so slim a book – I don’t know if Coetzee’s minimalist style gives that more impact or not. This book is written in a simple and very straightforward way – as allegories usually are. The main questions are totally apparent – Who are the barbarians? What is justice? This is an indictment against imperialism, for sure. This was another book which had been on my shelf for way too long. Sometimes I think the real power in these books is the immediacy of their own times. This won a whole lot of awards in 1980, it’s still quite good today – very serious issues are involved and handled well. I understand it’s frequently required high school reading. Excellent choice. I think perhaps some of the book’s power derived from the political situation in which Coetzee lived at the time – Apartheid South Africa struggling for change. 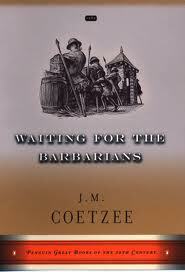 Today, I don’t know but I suppose plenty of countries could work for an example, but Coetzee isn’t living there.